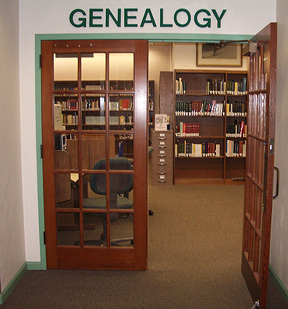 The Genealogy Room is located in the reference area on the west side of the library. Our volunteers are on duty to provide assistance with the genealogy collection and computer databases. Please consult the schedule above. The Society volunteer schedule is subject to change. Please contact a Reference Librarian at 263-7768 for schedule changes. Volunteers may be on vacation, if no volunteer is available, please see a Reference Librarian for assistance. Librarians provide limited assistance and do not perform actual research.